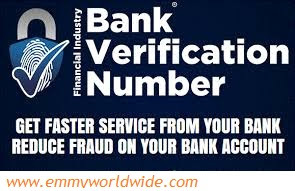 The Central Bank of Nigeria issued modalities for enrollment for Bank Verification Number (BVN) by Nigerian banks’ customers to reduce their difficulties in getting registration. Bank customers should present themselves for enrollment for the BVN from any part of the Town/City or States in Nigeria, without necessarily travelling to place were they open their Bank account in Nigeria. 2. Request for BVN Enrolment form from “Customer Care Center”, Fill and submit it. 5. Within 24hours the system confirms your application, your BVN is generated, and you will receive an SMS with your Bank Verification Number, within two weeks of your registration. Note: Inline with CBN directive, BVN registration may be closed on the 31st of October, 2015 and there will be no further extension. Go and enroll now.